How much does it cost to travel to Bangkok? How much money will you need in Bangkok? ฿2,204 ($69) is the average daily price for traveling in Bangkok. The average price of food for one day is ฿516 ($16). The average price of a hotel for a couple is ฿2,461 ($77). Additional pricing is in the table below. These average travel prices have been collected from other travelers to help you plan your own travel budget. How much money do I need for Bangkok? Bangkok: a name synonymous with all things exotic. The vibrant and exciting capital of Thailand is not just a hub for Southeast Asia, but also a destination into itself. Known for an active nightlife and party scene, as well as great food, historic temples, and busy markets, Bangkok offers a diversity to entertain even the most experienced travelers. Many people spend little more than a night or two in this city before passing on to the cultural north or beach filled southern regions of the country. If you choose to linger in Bangkok, you won't be disappointed. This populated city offers rare glimpses into real life in Thailand. You can wander through neighborhoods and markets that are designed not for tourists, but for locals. You'll see what everyday life is really like in this dynamic country. Those who breeze in and out of Bangkok may see little more than a dirty capital city with a gaudy nightlife, crowded streets, congested traffic, and countless touts, but those who delve a little deeper get to see Bangkok for what it really is. There are wonderful canals lined with homes and temples that peak out from every corner. While there is no shortage of glitzy and touristy temples in Bangkok, in the residential areas you'll find the more charming temples that are part of everyday life here. Definitely don't miss the markets in Bangkok where you can find unusual food options, beautiful cloths, and some great buys on souvenirs that haven't been heavily marked up. Still, remember to barter, because it's Thailand after all. Rattanakosin, or the "Old City" in central Bangkok, is home to the Grand Palace and various temples (known as "wats"). This area is perhaps the most visited area of the city by tourists, as it contains the palace complex with huge gardens and Wat Phra Kaew, Thailand's most sacred temple. Wat Pho, the large reclining Buddha, and Wat Arun are also nearby. If temples are your thing, another half dozen or so can be found in the surrounding area, with many more scattered throughout the city. Entrance fees vary by temple, and appropriate dress is required (long pants, no sandals). Note that many scammers are often outside some of these popular temples telling people that they are closed. Do not pay any attention to them, as the temples rarely close  visit the entrance yourself to see. These scammers are only attempting to divert you to their own illegitimate enterprises. Various history, culture, and art museums can also be found in Bangkok, such as the National Museum, the Museum of Siam, the National Gallery, and the Queen's Gallery. The floating markets of Damnoen Saduak (daily) and Amphawa (weekends only) are very popular day trips from Bangkok, at which visitors can take boat rides along the canals to witness the market activity of the locals and make purchases themselves. Both markets can be seen in one day. Be prepared to negotiate firmly for a boat tour along the canals, especially at the more popular Damnoen Saduak markets. The Khao San Road area is popular among younger backpackers and budget travelers, as it contains a very active nightlife, cheap accommodation options (hostels and flophouse-style hotels), and inexpensive restaurants. The nightlife (bars and clubs) in this area is what generally defines the stereotype of partying in Bangkok. Rattanakosin, as mentioned before, is where most of the attractions and sights are to be found, as this is the older part of Bangkok. Many festivals are also celebrated in this section of the city. Restaurants and shops are also plentiful. Silom is a business district during the day, but has a party atmosphere at night as it contains many trendy nightclubs and bars. Most higher-end hotels and restaurants can be found in Siam Square and Sukhumvit, as these neighborhoods are higher priced, and are full of luxury shops and their clientele. As this is Bangkok, these neighborhoods also have an active nightlife. 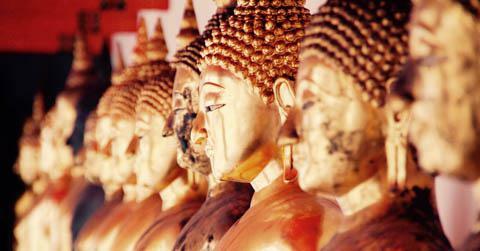 Tours in and around Bangkok come in a variety of shapes and costs. From Tuk-Tuk tours to bicycle tours to canal boat tours, there are many ways to view the popular and off-the-beaten-path sides of Bangkok. Muay Thai, or Thai Boxing, is a unique activity to Thailand, and not to be missed. Local boxers, not as large or menacing as to be expected, attack each other with kickboxing skills that any martial arts enthusiast would drool over. Visit Lumpinee Boxing Stadium or Ratchadamnoen Stadium for popular fights (with a steep entry fee for foreigners), or the venue by the MBK center on Wednesday nights for a free show. Massage parlors and Spas are quite popular. Most high-end spas are actually "spas" as westerners define the word. However, if you only want a massage and not a prostitute, make sure you inquire appropriately if you're in a smaller shop away from one of the glitzier neighborhoods. Look for "massage only" signs. For shopping, Siam Square is the mecca. The neighborhoods around the large shopping centers contain many small alleys (sois) with a plethora of small boutique shops selling every type of clothing item, souvenir, or gadget. Two large malls, the Siam Center and the MBK center, offer even more options. Keep in mind that many brand names are knockoffs and fakes, but that is part of the attraction for many visitors (as are the low prices). Thai Food! Bangkok, being the huge cultural center of Thailand, has every type of Thai food available at every price range. Furthermore, foods of other nationalities are plentiful as well especially European, Chinese, and Indian. Common Thai dishes such as Pad Thai and other non-spicy noodle plates can be found in many restaurants, and are a staple of many travelers new to Thai food. Pad Thai is a noodle dish, often served with chicken or shrimp, containing some spices, lime, and basil (although ingredients tend to vary). Somtham is another common street food dish involving noodles, spices, eggs, and fish sauce. Dinner cruises are popular in Bangkok, and quite easy to book. Inquire at your hotel or hostel or at the River City pier near the Si Phraya Express pier. Getting around Bangkok can be chaotic if only because of the intense traffic. Fortunately, many options are available. Public transportation is plentiful and varied. Perhaps the most fun form of transport is on the passenger ferries that run up and down the Chao Phraya or Saen Saep rivers. You just hop on and off the boats at their designated stops like it's a bus. (River taxis are also available). The Skytrain is a futuristic monorail that takes commuters and passengers across town to various neighborhoods. Also known as the BTS, the train does not go everywhere, but covers a good part of the city and connects to other transportation system. The Metro (or MTS) also has useful stops, but its tickets are not compatible with the Skytrain (they are run by different companies). Local buses are cheap, plentiful and plow various routes throughout the city. Look for maps on bus station signs. The 554 route goes to the BKK airport, while the 79 route connects Siam Square with Khao San Road and the Grand Palace. The Airport Rail Link is considered the most efficient way to get between the airport and the city center, connecting with the other systems. Taxis come in various forms. Regular metered taxis (cars) are plentiful, but traffic is often bad. Always ask to use the meter or negotiate in advance. The yellow-green taxis are owner-operated and quality, service, and price can vary greatly, so be cautious of these. Tuk-Tuks are perhaps the most fun way of getting around. These motorized rickshaw carts are fast, small, and loud, but usually cheaper than regular taxis. They can also weave around traffic jams more efficiently. Most do not have meters, so negotiate prices before you depart. Motorbike taxis, like Tuk-Tuks, tend to be faster, but at a risk. Once again, always negotiate. And here are some great tips for how to get to Khao San Road.